It's usually stunning cars we associate with Pininfarina, so we weren't expecting one of its latest creations to be launched in Germany during Paperworld, which you could think of as the Frankfurt Auto Show for stationery and writing instruments. 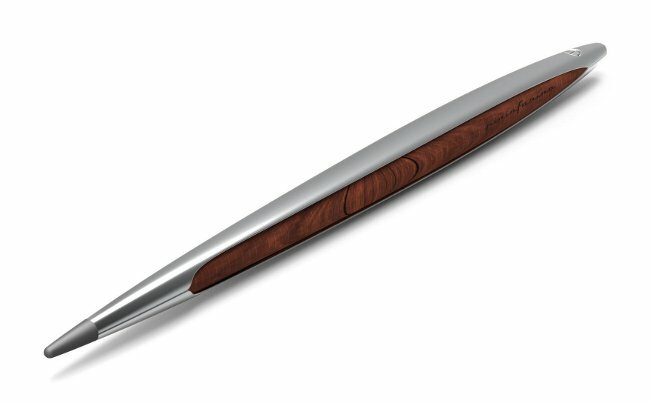 The said creation is the 4.EVER Pininfarina Cambiano, a pen that has been inspired by the concept car of the same name. As with most of the designs of the legendary Italian firm, it is a sleek, elegant and truly beautiful thing, handcrafted from aluminum and wood. The 4.EVER Pininfarina Cambiano will also "be matched with a notebook realized in stone paper," which is described in the press material as stronger, more eco-friendly and water-resistant compared to the leaves of your regular writing pad. What's more, the notebook will be "enriched by the original sketches of the Cambiano concept car." Says company chairman Paolo Pininfarina: "We wanted to create, with Napkin's collaboration, a kit addressed to all the people who love design and innovation, giving life at the same time to a timeless object with the typical traits of the Pininfarina style: elegance, purity and innovation." No price has been given for the 4.EVER Pininfarina Cambiano, but we expect the cost to be astronomical. Let's just say this isn't for those who are in the habit of losing their rollerballs.